The ark-shaped museum, located in Tel Aviv, houses 5.5 million specimens from around the world, from early human skulls to rare taxidermy pieces. Israel attracts millions of visitors from around the world every year who are eager to discover the country’s cultural and religious artifacts. The museum, expected to host 150,000 visitors per year, will be now able to offer visitors to the Holy Land an in-depth look at the region’s unique natural history, both ancient and modern. 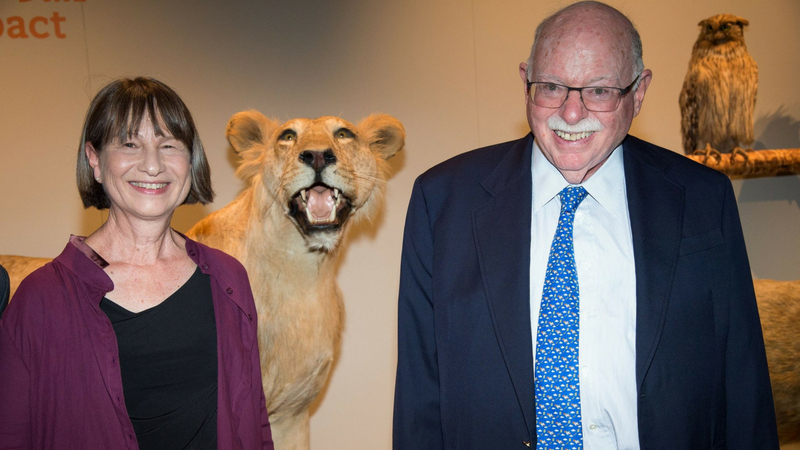 Establishment of the $40 million museum was made possible by prominent American philanthropist Michael Steinhardt, cofounder and funder of Birthright and a frequent donor to Israeli initiatives, and his wife, Judy. The building was designed by Tel Aviv-based architecture firm Kimmel Eshkolot. 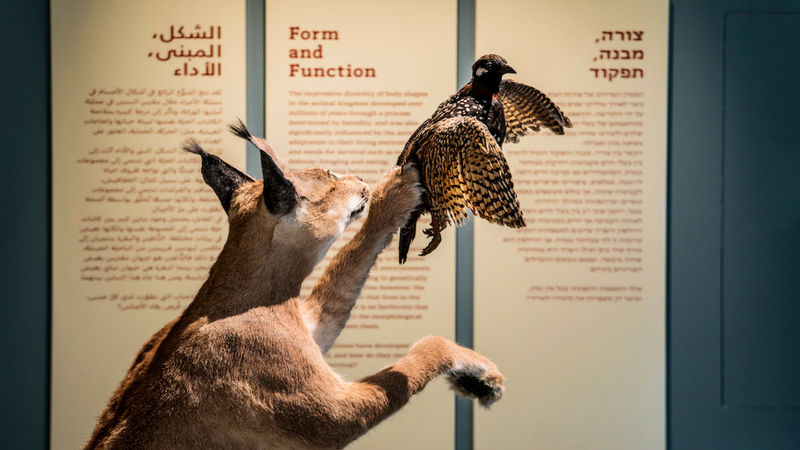 The museum presents eight permanent exhibitions, displaying thousands of items from the national natural history collections that previously available only to scholars at Tel Aviv University and several other museums in Israel, as well as one temporary exhibition. Traditional dioramas and innovative interactive displays spread across several floors are connected by sloped rampways, allowing a continuous, flowing movement without any real need to climb stairs. The museum includes items that have been collected since the end of the 19th century, such as the collection of German zoologist and Catholic priest Ernst Johann Schmitz, who lived in Israel a century ago. In the “Treasures of Biodiversity” exhibit, Schmitz’s taxidermy pieces include the last bear from 1916, an Asiatic cheetah from 1911, and the last crocodile from the Taninim River, all species that have become extinct in Israel. In another exhibit, a 20-foot-long interactive map of Israel showcases current environmental problems including the depletion of Israel’s only freshwater source, the Sea of Galilee, and the shrinking of the Dead Sea by three feet every year. 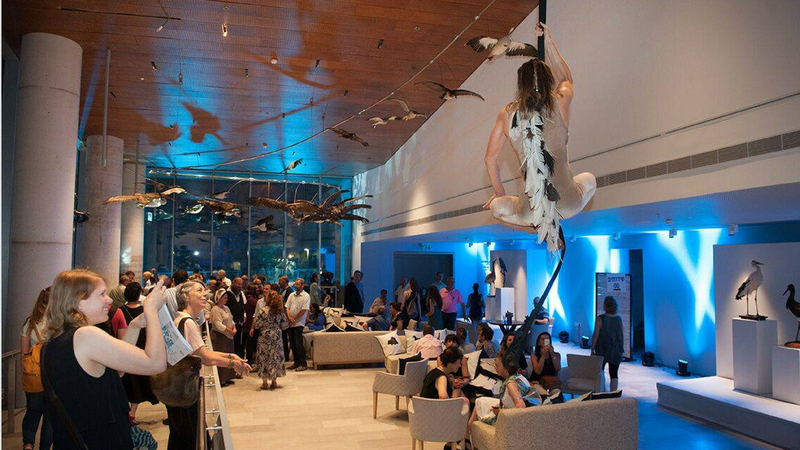 The importance of adopting environmentally friendly lifestyles and behavior is conveyed in the museum’s “Human Impact” exhibition, urging young visitors to stop littering and minimize light pollution along the coasts that endangers sea turtle populations. Other exhibits include “Bugs and Beyond”, which includes live creatures and teaches visitors about the world of arthropods – the largest and most diverse phylum in nature; “Life in the Dark”, which offers a glance at animals from Israel and around the world that live without daylight; “Israel’s Landscapes”, which surveys the impressive range of habitats in Israel; “Urban Nature”, which reveals the city life of wild animals; “What Makes Us Human?”, which surveys the biological and cultural evolution of the human species. 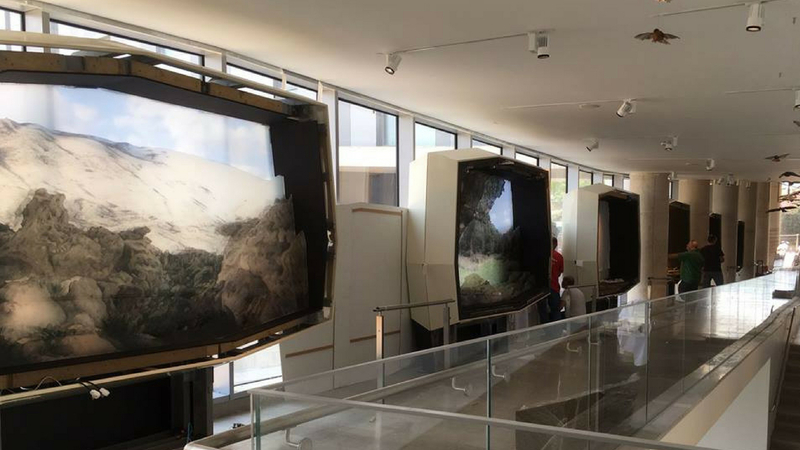 The temporary exhibition on display at the Museum’s opening is Life Object, which represented Israel at the 2016 Architecture Bienniale and deals with the influence of nature on architecture. One of the challenges in designing the building, according to Kimmel Eshkolot, was designing a solution to store the museum’s research collections that would meet the proper controlled climatic conditions. The result is the ark-shaped wooden structure, visible from the museum’s exterior, originally designed to look like a treasure chest. Only after construction did the building take on new meanings, the main one being Noah’s Ark, preserving nature’s treasures for future generations. Visitors to the museum pass through the ark where they are able to view the rooms that house the collections. At the museum’s labs and research facilities, international scientists from a range of disciplines will study samples of the natural world to further their understanding of ecosystems’ modes of action and their conservation. In addition to its exhibits, the museum also includes study galleries for workshops and other activities, an auditorium, and in the near future, a shop and a restaurant. On the weekends and holidays, research and craft workshops, film screenings in the auditorium and other activities will be available for visitors.